When we purchased our home in 1995, the existing southern exposure (back of the house) garden bed was quite modest. Fortunately, I have met with little to no resistance from my husband as the bed has grown exponentially over the years, reducing the size of our lawn. 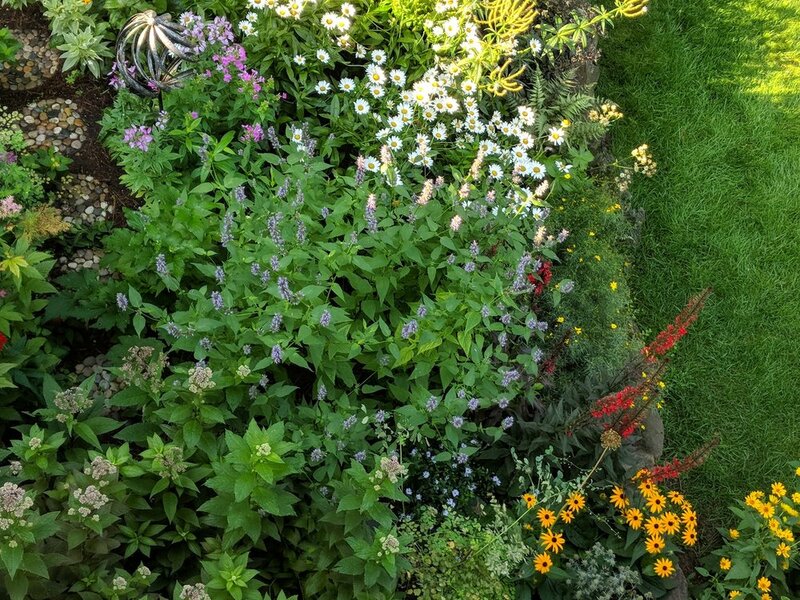 The current garden personality is "ecclectic-chaos" with dozens of tall flowering perennials that bloom in riotous succession from late May to late October. Tall phlox, agastache, crocosmia, lobelia cardinalis, eutrochium and others provide non-stop hummingbird nectar. I've actually witnessed our resident male ruby-throat breaking into a sudden U-shaped mating dance upon spotting a female dining on bee balm nectar in this bed. Monarda, black-eyed susan, joe pye weed, veronicastrum and others, attract many varieties of bees and butterflies. Dried seed pods are left undisturbed well into late fall for scavenging goldfinch. After years of organic soil amendments, plants expand their footprints pretty significantly every year, requiring thinning. The worst culprits are the shasta daisies and the loosestrife. Divisions go to neighbors and friends just starting out with gardening. 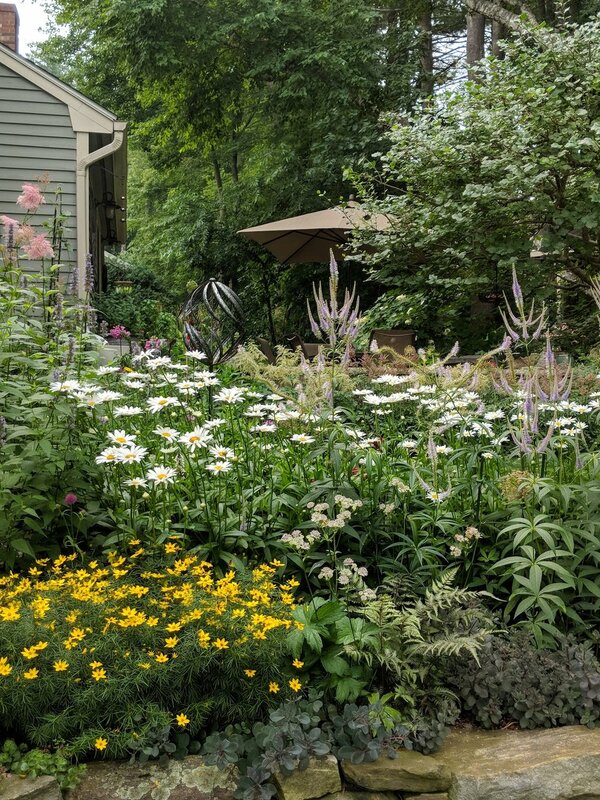 In 2018, daisies and coreopsis were thinned, making way for less common perennials like Veronicastrum 'Fascination', Knautia 'Macedonia' and a variety of allium and penstemon. Aerial photos depict the state of this garden bed in April, with newly installed drip irrigation tubing and later in August during its peak of color!